The DS6708-DL combines all the features of Motorola's standard DS6708 imager, such as omni-directional 1D/2D bar code scanning, with embedded and server-based parsing agents that enable users to read the PDF-417 bar code on a US driver's licence and use that information for a multitude of applications. Because the parsing is done in the scanner and the output is controlled by the user, the scanner can easily be used in all environments with very little start-up effort. 1.3-megapixel camera handles images, bar codes and documents. Supports for all major 1D, PDF, postal and 2D symbologies. Lowers IT expenses by enabling remote management from a central location. Withstands multiple drops, minimising downtime. Ensures compatibility with future technology. Eliminates need to align item and scanner, cutting down on training time and cost. 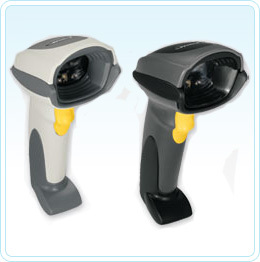 Enables presentation scanning and automatic switching between hands-free and hand-held modes. Ambient light immunity Immune to normal artificial indoor and natural outdoor (direct sunlight) lighting. Scanner warranty Subject to the terms of Motorola's hardware guarantee statement, the Symbol DS6707/8 hand-held scanner products are guaranteed against defects in workmanship and materials for a period of five years from the date of shipment. 5 Specifications are subject to change without notice.